Was there ever a more fascinating villain than Shakespeare’s Richard III? He is morally repugnant and physically repulsive, yet he also displays a keen intellect and masterful wit beginning with the very first words he speaks in the play. “Now is the winter of our discontent / Made glorious summer by this sun of York; / And all the clouds that lour’d upon our house / In the deep bosom of the ocean buried.” The poetry of that famous line itself is stunning and, in Richard, Shakespeare has created a character that uses words with dazzling facility, twisting and manipulating them much like he does the people around him. Gregory Sims is Richard in Sacred Fools’ current production and the third I’ve seen in the past six months. It is a monstrously huge role, second only in lines to Hamlet, and one that requires that the actor portraying him use all of his wits to seduce not only his fellow actors onstage, but the audience as well. Sims clearly understands the role though his approach to it lacks subtlety. Like a bull (or in this case, boar) in a china shop he barrels his way through the scenes, stringing together whole sections of text at breakneck speed, often while yelling at the top of his lungs. It’s a curious habit repeated by many of the actors onstage who are either uncertain what they’re saying and compensating with volume, or who overplay their roles in strokes so broad that I wondered whether Sacred Fools might have considered doing a send-up of the play. Leon Russom’s Duke of Buckingham, Kimberly Atkinson’s Queen Elizabeth and Cynthia Beckert’s Duchess of York are the notable exceptions. Russom gives his ambitious Buckingham a studied thoughtfulness that is quite poignant when he realizes Richard is about to betray him. Atkinson is an ever-dignified and passionate Elizabeth, and Beckert a strong-willed Duchess. Others, however, speak the Bard’s text awkwardly, either throwing away lines in a much too careless contemporary manner or infusing them with a ridiculous phony pomposity. The worst offenders are those that put on an unsuccessful British accent. In all cases they serve as a great distraction to the story. A stronger hand by director Ben Rock may have rallied the troops around a consistent central vision, along with some detail work from a voice and movement coach. Neither is listed in the program and it’s a long three hours watching actors who have either blown out their voices in last night’s performance or who do not have the breath support to offer more than a film reading. The result is a production whose most powerful moments, of which there are several, are lost among the many unfocused and superficial ones. And that is the biggest discontent of all. Technical enhancements are suitably effective, especially period costumes by Jennifer Christina Smith, music by Kays Alatrakchi, and the versatile set by Tifanie McQueen. 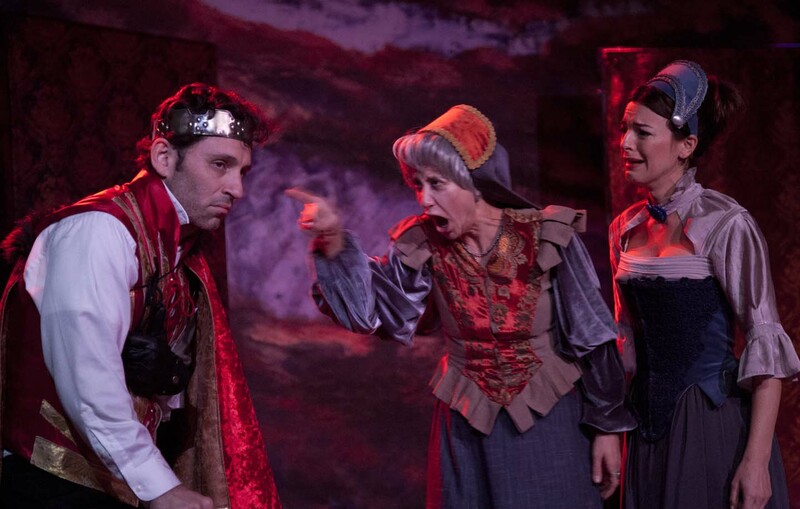 Sacred Fools’ Richard III runs through February 25 at 660 N. Heliotrope Drive, Los Angeles, CA 90004. For tickets and more information go to www.sacredfools.org.